Our permaculture garden is looking very rich and green at this time. We had more rains than normal and the veggies and salads and fruit are growing in abundance. 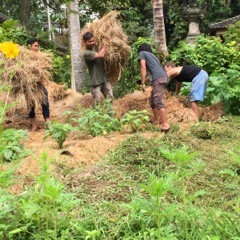 Our local team, Kadek, Gede, Fendy and our volunteer Cedric are carrying the rice straws to mulch the beds. Cedric had made some EM (effective micro-organism) from scratch and we are now looking at the difference between the beans with and without his brew. The first plants are without, the second with. We would say that the difference in height is quite visible. What do you think? We kindly invite you to check our Jiwa Damai permaculture courses or internship programs in Bali in order to put your own ideas in practice!